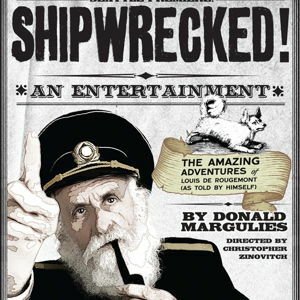 Shipwrecked! An Entertainment tells the grand tale of Louis De Rougemont, a famous adventurer who gets lost on the high seas and ultimately ends up seeing fantastic things and meeting exotic people. The story is told to the audience by Louis himself, who is proud to have the viewers come along, as he retells the story of his journey from the seas of England to the exotic lands of Aboriginal Australia and back again. He is aided in his retelling by two highly talented players, who play all of the people (and animals) that Louis meets along the way, all while providing sound effects and scenery changes, seamlessly. All might not be as it seems, however, as the truth of Louis’ great tale is called into question by multiple experts. Shipwrecked! brings the joy of storytelling alive, and questions whether a story being real or fabricated makes the journey any less treasured.